No, not the book and personal productivity method by David Allen, though somewhat related in intent. I’m talking about getting things done in software development. Traditional phased software development processes tend to have a long delay between starting to work on something, and having something working that people can use. During this time, there may be a lot of work expended on partial products and artifacts to support the process, but little or nothing that could be used for its intended purpose. Both timebox-oriented [e.g. Scrum] and flow-oriented [e.g. Kanban] methods try to emphasize getting things done so that they can be used earlier and provide value. Even if you decide not to use them earlier, at least they can be evaluated for suitability of the intended use, and progress toward a larger collection of functionality that will be deployed for use together can be more reliably tracked. In my experience, Agile projects almost never have a single milestone at the end. The business wants to see multiple milestones along the way, taking internal releases from the development team even if they’re not prepared to make them public. The simplest dashboard I know to illustrate this situation is a burnup chart with multiple goal lines, indicating the goals of each milestone. This sort of chart is trivial to create by hand or with a spreadsheet. The typical Agile Project Management software, while providing a myriad of ways to view data, never seems to include something as simple and powerful as this. Fortunately, it doesn’t take much time to create your own. It takes a few minutes at the end of each sprint to update the chart, and you can make sure that the data is correct as you do so. I hope this will be done by then. These are sad and scary words to me. When I hear them in the context of a software development project, I associate them with a project unlikely to meet expectations. Further, it’s likely that there is no good indicator of what can be delivered when. With no hard evidence to tell them what’s possible, and to judge the effects of changes they try, people fall back on a strategy of hope. They no longer feel in control of the situation. This signals the underlying hopelessness. When you can’t make things come out the way you want, when you can’t even predict how they will come out, one natural response is to give up. Often the cultural expectations don’t allow saying “this project is in trouble.” The person who does so is the person who will attract all the scrutiny. Without the clear data to back up the perception of trouble, why stick your neck out? Others should be noticing the same thing; let them call attention to it. And when things don’t work out as “hoped,” if weve “done our part,” then someone else will get the blame. You can’t solve a problem that no one wants to see. Instead, we’ve found an acceptable way to fail. Most of my recent writing has not yet been published. That, and work on the upcoming AgileDC Conference and Agile India beyond that, have meant relatively little output on my blog. I apologize for that. I’d like to share with you an interview conducted by Bill Fox for his 5 Minutes to Process Improvement Success project. My interview, “Measure Progress in a Way that’s Visible and Reliable,” is found on page 69 of the PDF. You’ll also find interesting interviews with Karen Base, Kevin Schaaff, Hillel Glazer, Scott Ambler, Neil Potter, Bob Payne, Mike Bonamassa, Mario Hyland, Jeff Dalton, Paul E. McMahon, Karl Wiegers, Mary Lynn Penn, Ally Gill, Alan Shalloway, and Tom Cagley. And there are more to come in the future. and relax. It’ll work out the best it can. False precision won’t make it any better. Precision can actually be the enemy of performance goals. To be sure, feedback is definitely a positive thing. But it appears that if you want to keep yourself motivated, it’s best to get a more generalized, imprecise feedback that lets you know you’re heading in the right direction, rather than the precise coordinates of where you are on the path. In my recent posting on estimation precision, I briefly mentioned how you can estimate when certain features will be done, or estimate what features will be done by a given date, using a burn-up chart. Some people don’t find this an obvious and easy thing to do. Let me explain in more detail. From time to time, a discussion rattles around the internet about “how can you tell how Agile you are?” Over and over, I see people tout some variant of the Nokia Test as a way to tell if you’re Agile enough. For the most part, I think this is hogwash. Don’t get me wrong. I’m all in favor of an Agile Team using something like the Nokia Test (or, better, Nationwide’s “Agile Tea Leaves”) as part of a self-examination and retrospection. But any sort of discussion of conformance to practices is way too low-level for the executive team, or even middle management, of an organization. Agile is the tool, not the goal. The goal is to accomplish the things the organization wants to do. Agile is a tool to allow the organization to accomplish its goals more reliably and in a more timely fashion. With this in mind, I thought about what a high-level manager wants from the organization’s projects and the process used to develop them. How can this manager tell if the development staff is doing a good job, or could be doing better? 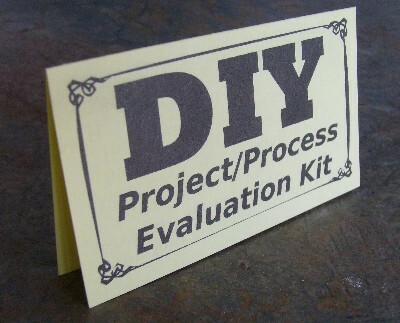 I came up with this Do-It-Yourself Project and Process Evaluation Kit that such a manager can use, no matter what process the organization uses for development. I think it will also be useful for Project Managers who need to report upwards. Report in these terms, not in the details of the development process. Serial lifecycles provide a (false) prediction. And, boy oh boy, is that prediction comforting to your senior managers. “When will the project be done?” might be their most-asked question. Of course, a serial lifecycle provides a prediction that’s almost guaranteed to be wrong, especially if you use a project scheduling tool. The tool provides you a single-point estimate, which is the first date you can’t guarantee the project won’t be done by–the first possible, optimistic date.